South Africa, 29 May 2018: For a remarkable second year in a row, the Boschendal Appellation Series Elgin Chardonnay 2016 was named not only the Best Elgin Chardonnay but also took home the trophy for being South Africa’s top Chardonnay at the International Wine Challenge (IWC). So far it has been a stand-out year for Boschendal. Not only is the estate celebrating over 300 years of viti- and viniculture, but it’s also garnered a multitude of awards in 2018 – including 21 awards in May alone. 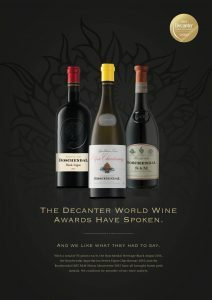 As well as its IWC wins, Boschendal took home three golds, five silvers and 12 bronze awards at the 2018 Decanter World Wine Awards (DWWA), plus silver at the 2018 Syrah Du Monde awards. Gerber concludes that with the weather cooling down, the 1685 is the perfect choice for winter – especially when paired with dishes like a hearty, slow cooked beef or lamb stew or a Madagascan-peppercorn-crusted tuna steak. One of the most established and iconic wine estates in Franschhoek, Boschendal has reinvented itself to appeal to a new generation of wine lovers. The estate’s approach to wine encourages visitors to understand the origin of the wine, the winemaking process and taste the terroir in each glass. While Boschendal exports to over 50 countries, the winemaking team endeavours to entice the palates of both international and local wine lovers with modern wines and welcomes all visitors to explore the farm, which has undergone a true metamorphosis serving delicious dining options, an abundant five-acre food garden and the philosophy of working sustainably with nature to produce real food.